Chilli is somewhere in my top 5 favourite meals- particularly in the Autumn months when it reminds me of the darker nights, golden leaves and bonfire nights of my childhood. This particular version is meat-free but you won’t even realise. Its fantastic for all ages and you can easily increase quantities to feed a crowd. We love it spooned over paprika roasted sweet potato topped with my hidden veg guacamole and sprinkled with cheese [a meal that includes an amazing 7 different vegetables!] -but its equally good just with plain rice or served in tacos. Place the onion and peppers in a food processor and blitz down into a rough puree. Preheat the oil in a large saucepan and add the onion and pepper mix. Cook for 2 minutes and then add the whole garlic, spices and tomato puree. Cook for 1 minutes and then add the passata and stock. Bring to the boil and then reduce to a simmer. Cook uncovered for 25-30 minutes until reduced and slightly thickened. Add the beans and cook for a further 10 minutes. Serve immediately or place in the fridge for up to 2 days. If serving with roasted sweet potato ‘jackets’: quarter the potatoes and preheat the oven to 200oC. Coat the quarters with 1 tbsp oil, 1/2 tsp smoked paprika and 1/4 tsp sea salt per potato. Place in the oven for 30-35 minutes whilst your chilli is cooking. Serve 1-2 quarters per person with a big spoonful of chilli, my hidden veg guacamole and cheddar cheese. Can anyone truly resist macaroni cheese?! The sauce for this recipe is secretly loaded with squash which not only makes it perfect for getting reluctant veggie eaters to crank up their 5-a-day consumption but it’s also fantastic to use up all the flesh from your Halloween pumpkin later this month. You can make the sauce a few days ahead which makes it perfect for weekday evenings or when you have a hoard of kids to feed. Place the butternut, stock and garlic in a saucepan and bring to the boil. Reduce to a simmer and cook for 20minutes until the squash is tender. Add the butter, 50g cheddar and mustard. Allow it to melt and then remove and place in a blender. Blitz into a smooth sauce. Meanwhile cook the pasta for just 6 minutes and drain. I can’t get enough of this creamy coconut curry at the moment. It smells incredible and feels both wonderfully comforting yet virtuous and wholesome with so many veggies and spices. It works equally well using squash, potato, cauliflower or aubergine as the main veggie and for anyone weaning its also fantastic blended down to a rough purée for babies’ first tastes. All in all you need this in your week- especially if you are vegan or looking to try more meat free days. Heat the oil in a large saucepan. Add the veg of your choice and fry for 5 minutes. Meanwhile, put all the curry paste ingredients in a food processor and blitz to a paste. This is so delicious and so packed with goodness that you will feel particularly wonderful when you see your kids tucking in! I try not to ‘sneak in veg’ as its important that children want to enjoy vegetables in their own right but I guess this is a hidden veg sauce if ever there was one! It also makes a delicious soup if you want a lighter meal but remember it won’t feed quite so many. Note: make a bigger batch and freeze for quick meals when you are short on time. Place the onion, carrot, mushrooms, tomato puree, garlic, rosemary and water in a food processor and blitz down until roughly chopped. Heat the olive oil in a medium saucepan and add the chopped vegetables. Cook for 5 minutes over a medium heat before adding the lentils, passata and stock. Bring to the boil and then reduce to a simmer and cook for 45 minutes. Add the parmesan and cook for a further 5 minutes before removing and serving immediately or blitzing down into a smoother sauce- whichever your family prefer. Makes enough for 2 adults and 2 children. Preheat the oven to 200oC and line a large circular ovenproof dish with baking parchment. Set aside. Place the spring onions, garlic, eggs, curry powder and flour in a food processor and blitz until you have a rough batter. Remove and place in a large mixing bowl. Add the grated + squeezed courgette and the crumbled feta cheese. Stir to combine and then transfer into your prepared dish. Place in the oven for 30-35 minutes until set and starting to go golden. Remove and leave to cool for 10-15minutes before serving. 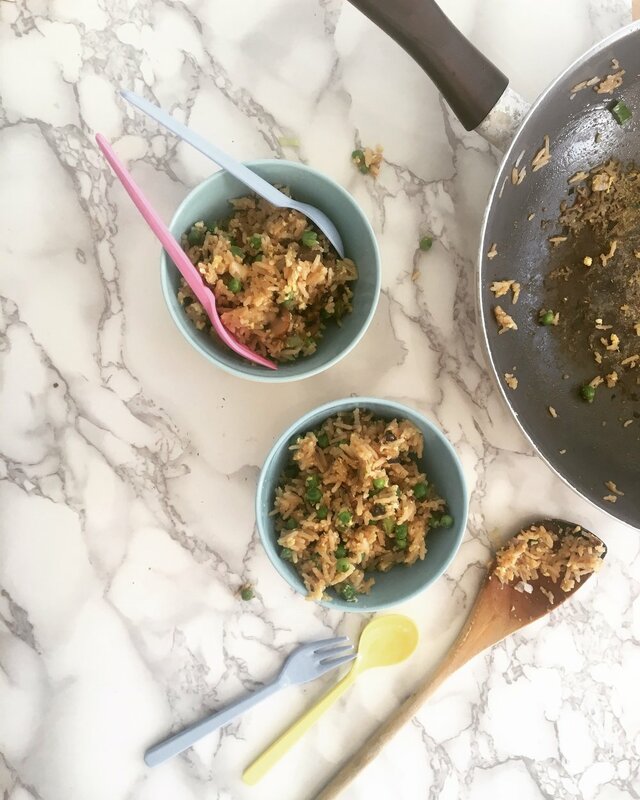 Egg-fried rice is one of my favourite family dinners because its just so easy to throw together plus you can use just about any veggies (or chicken) you have in the fridge and its comforting but healthy all at the same time! The quantity below makes enough for two hungry children but I often double it up and it feeds me, my husband and our two small children. This is literally the easiest risotto you will EVER make! Turn the oven on and pop it in. Voila. I developed this recipe just to make a quick meal for my daughter whilst we were busy playing so the quantities below will only feed two small or one larger child but just increase as suits and you have a fantastic dinner for all the family. Preheat the oven to 200oC and prepare an oven proof dish. Put the rice, water and garlic in the dish and put to the lid on. Place in the oven for 20minutes. After 20 minutes remove and stir through the pumpkin puree and cheese. Place back in the oven for 8-10 minutes or until piping hot throughout. Serve with some extra cheese. This soup is delicious for all ages, ridiculously versatile and freezes fantastically. The recipe here makes a hearty adult portion or two kids' portions but just increase the quantities as suits. You can add whatever you want to make it more filling- my daughters like it with noodles to slurp up (and sometimes chicken for added protein) but I've also had it with roasted cauliflower and chickpeas or with spiralled courgettes and prawns. Put all in the ingredients in a small saucepan and bring to the boil. Reduce the heat to a low simmer and whisk everything together. Once heated through remove from the heat and serve. This recipe is absolutely delicious and please don't think that because its a risotto its too time consuming. I cook the rice in vegetable stock for 20-25minutes (no stirring required) whilst I'm busy doing something else and the pea puree takes 2 minutes to blitz down in a food processor. I pop everything in the fridge and reheat at dinner time which makes it a stress free and super quick dinner when there are hungry, demanding tummies around! BLW Tip: blitz the cooked risotto down for 30 seconds and mould into small balls for little hands to grab hold of. Meanwhile, in a food processor blitz down the pesto ingredients along with the extra peas and garlic (plus the mascarpone and salt, if using). Remove and set to one side or chill if preparing ahead of time. After 20-25 minutes of the rice cooking, add the parmesan, peas, remaining 20g butter, lemon zest and juice and the pea puree. Stir through and bring to the boil. Turn off the heat and cover for 5 minutes to allow everything to melt in. Serve immediately with plenty of extra Parmesan. if preparing ahead: place the cooked rice in a container and chill immediately. for adults and older children: add 1/4 tsp salt to the final risotto plus some extra lemon zest and fresh mint. A sprinkling of crispy pancetta also goes down a treat with meat eaters! 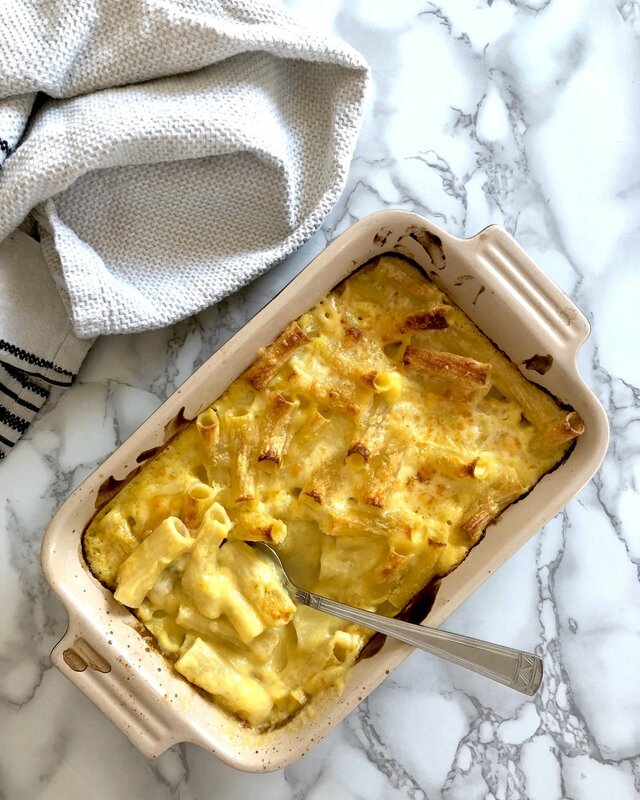 This is so quick and easy you will be amazed- using single cream in place of a classic béchamel sounds a bit naughty and extravagant but it actually makes the whole dish much lighter and a whole lot quicker! I have used blitzed down cauliflower, along with breadcrumbs, for the topping because firstly its a fantastic way to sneak in some veggies and also because everyone knows cheese and cauliflower are delicious! For the topping: put the parmesan, breadcrumbs and cauliflower in a food processor and blitz down until the mixture resembles breadcrumbs. Scatter evenly over the pasta and sauce and then place in the preheated oven for 25-30 minutes or until golden and bubbling. Serve immediately. Laksa is a delicious, fragrant Asian soup that we eat on a regular basis. The sauce takes minutes to prepare in a blender with no need to pre-cook the sweet potato and the result is a wonderfully vibrant dish packed with super healthy sweet potato, broccoli and spinach so the whole family will be full of energy! Place the first 11 ingredients in a blender and blitz down until you have a thick sauce. Remove and store in the refrigerator until you are ready to cook the curry. When ready to eat place the noodles in a heat proof bowl and cover in boiling water for 5 minutes before draining and setting aside. Meanwhile, heat the oil in a wok or large frying pan and add the broccoli. Stir fry for 2-3 minutes before adding the spinach and cooked sweet potato cubes (if using) and cook for a further 2-3 minutes. Add the drained noodles and the sauce. Bring everything to the boil and then reduce to a simmer for 5 minutes. Serve immediately. early weaning puree: once everything is cooked remove 120g and blitz down. Freeze half and serve the rest to your little one. Once you've made pizza this way you won't turn back! This recipe makes four generous toddler size pizzas but you can easily vary the size and toppings according to preference. The dough is extremely straightforward and requires only 2 minutes kneading! You can also portion up the dough and freeze for later- very handy for adult snacks too! For the sauce: heat the oil in a small frying pan and add the tomatoes and garlic. Stir for one minute and then add the water. Continue to cook for 5 minutes or until the tomatoes have broken down and the water has evaporated. For the pesto: place all the ingredients in a food processor and blitz down. Taste and add a little more lemon if you want. Easy! For the pizza: preheat your grill to the highest setting. Divide your dough into 4 small balls. Place a small frying pan on a high heat and don't add any oil. Using your hands push one of the balls of dough into a disc about 12-cm wide. Once the frying pan is piping hot place the disc carefully in it. Spread a quarter of the tomato sauce over the centre leaving a 1-cm wide border. Break up the mozzarella and place on top of the tomato. Finally, drizzle pesto over the pizza. After 1-2 minutes on the heat the bottom of the pizza should be brown and toasted. Place straight under the grill for 1-2 minutes until golden and the cheese is bubbling. Repeat with the rest of the dough. Traditional potato gnocchi is renowned of being a bit tricky but this ricotta based recipe is pretty much failsafe and so quick you won't believe it! The recipe itself is a combination of gnocchi and the lesser known but wonderful Tuscan dumpling named 'gnudi.' Regardless, they are absolutely delicious and my whole family would easily eat a mountain of them any day. Fill a large saucepan with water and bring to the boil. Meanwhile, place all the ingredients, apart from the flour, in a food processor and blitz until you have a smooth light green paste. Remove and place in a large bowl. Add the flour and using a wooden spoon or spatula stir through until combined- try not to over work the mixture otherwise you will get tough gnocchi. Lightly flour your hands and then remove half the mixture from the bowl and roll into a sausage with an approximately 1-inch diameter. Using a knife cut into 2-cm gnocchi and place to one side on a lined baking tray. Repeat with the second half of the mixture. By this time your water should be boiling. Using a slotted spoon drop 4 gnocchi into the water at a time and wait until they float back up to the top (1-3 minutes) before removing onto the other side of your lined baking tray. Repeat with all the gnocchi. Once they are all cooked you can either serve straight away [drizzled with olive oil or my pea pesto and extra Parmesan] or, chill for a couple of days and reheat in the oven [add extra grated parmesan on top and place in the oven for 8 minutes at 200oC- serve drizzled with olive oil or pea pesto and even more Parmesan]. Risotto is a great meal for little ones as you can chuck just about any vegetable in and coupled with the creamy taste and texture of the rice you have a winner! Some people find it a little daunting but this recipe is extremely straight forward and requires very little attention and minimal stirring. I cook the butternut two ways which makes the final dish more interesting texturally for both kids and adults! In a large saucepan place the butternut, stock and garlic. Bring to the boil and cook for 20minutes or until the butternut can easily be pierced with a cutlery knife. Meanwhile, place the butternut for roasting in a medium ovenproof dish and drizzle over the oil, salt (if using) and a good grinding of black pepper. Place in the preheated oven for 40-45 minutes or until tender and golden. Check your stock/butternut mixture after 20 minutes- the butternut should be easily 'pierceable' with a cutlery knife. Remove into a blender and blitz into a smooth liquid. Place the empty saucepan back on the heat and melt 30g butter before adding the rice and onion. Cook for 3-5 minutes. Add the blitzed butternut stock and bring to the boil. Reduce to a simmer and cook for 25-30 minutes, stirring occasionally to prevent it catching. After this time, add the parmesan, roasted butternut and remaining 20g butter. Turn off the heat and cover for 5 minutes to allow everything to melt in. Serve immediately with plenty of extra Parmesan. just for adults? add 1/4 tsp salt and a sprinkling of fresh thyme to the final risotto. This frittata recipe is absolutely delicious and can either be made into mini frittatas (which are fantastic for filling lunch boxes) or alternatively, you can cook one large frittata which makes a great light supper accompanied by salad and/or some homemade wedges for 2 adults and 1-2 small children. Preheat the oven to 180oC and grease a muffin tin. Set aside. Steam 150g cauliflower for 10-15 minutes until easily pierced with a cutlery knife. Meanwhile, blitz down the other half with the shallots and rosemary in a food processor until it resembles couscous. Remove and place in a large bowl. Add the remaining ingredients, apart from the nigella seeds and steamed cauliflower and stir to combine. Add the steamed cauliflower and lightly break up making sure to keep some florets whole if you can. Using a tablespoon, divide the mixture between the prepared muffin tin and then sprinkle with nigella seeds. Place straight in the oven for 25-30 minutes or until puffed, golden brown and set. Remove and set aside to cool before removing the muffins from the tin.